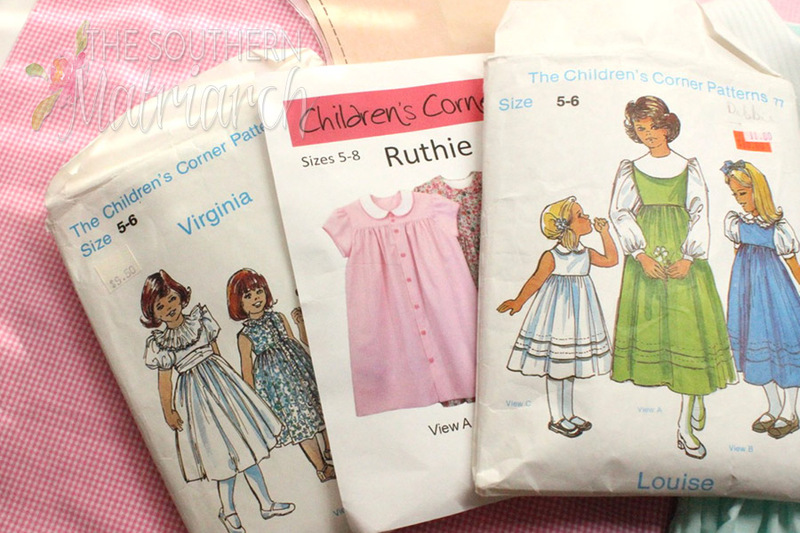 I have been asked to do a tutorial on how I altered the Children's Corner Louise for both a smocked insert and sleeves. 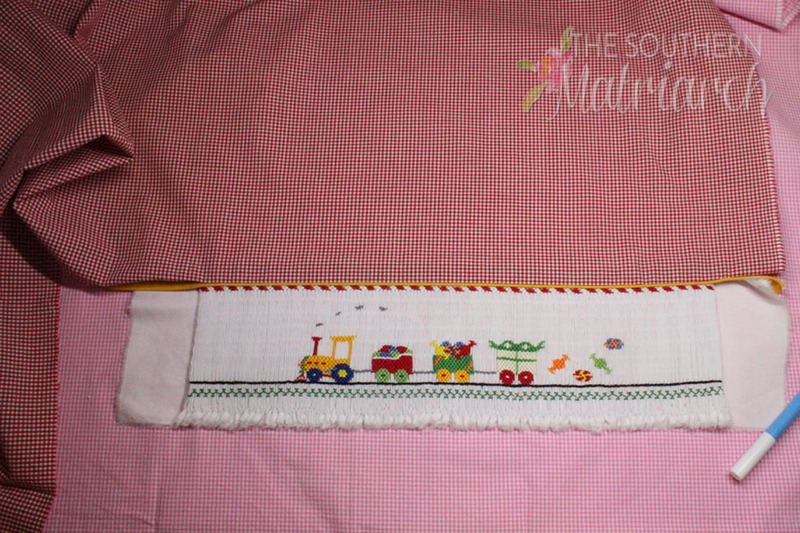 This post will be about the smocked insert. Another will follow in a day or so with the sleeve alteration. First off I am not a pattern drafter but I am a fair to midland instruction follower. For many years I have heard many wiser than I say how the pieces/parts of Children's Corner patterns are interchangeable. I have found this to be true. 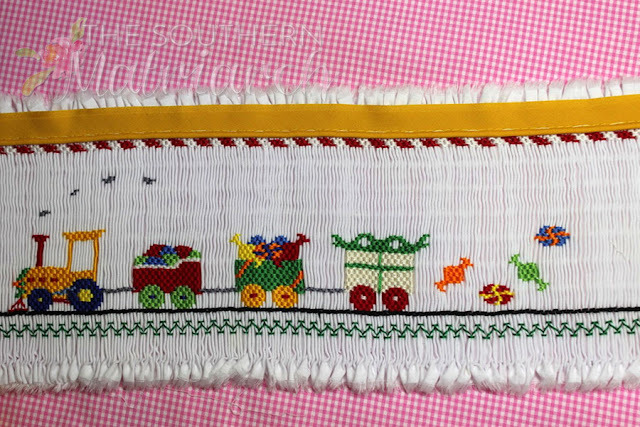 This is not always the case of every pattern line, but Children's Corner patterns were developed over the years using the same pattern blocks. This is what makes them interchangeable. 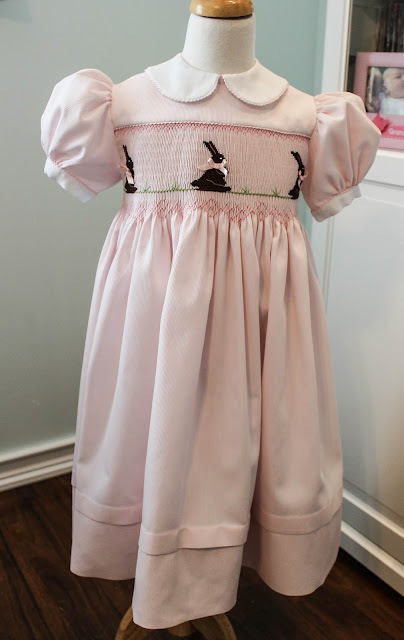 I love the way Louise fits, it is appropriate for a little bit older girl while still allowing for some design changes. I knew I wanted it smocked but at six and half I felt like a basic yoke like CC Lee was a tad younger look than what I was going for. That bodice is a blank canvas for so many design changes. 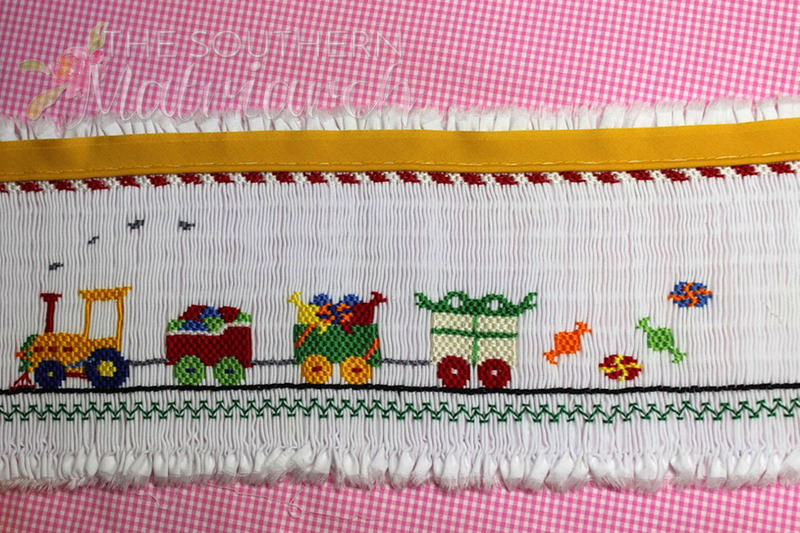 I chose to insert a smocked panel. One thing to keep in mind is proportion. 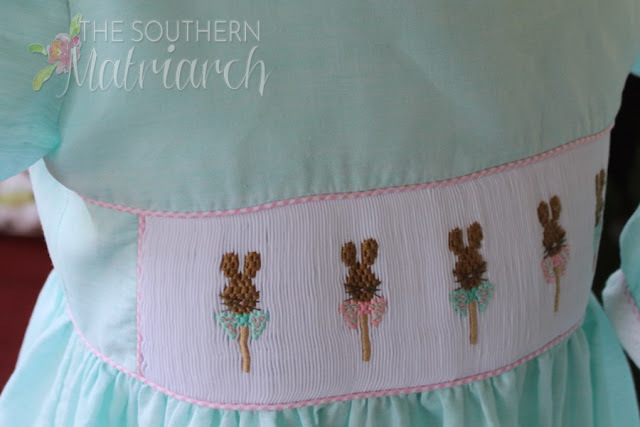 I am not a big fan of a smocked insert covering a child's entire chest. To me, it looks over done as well as heavy. 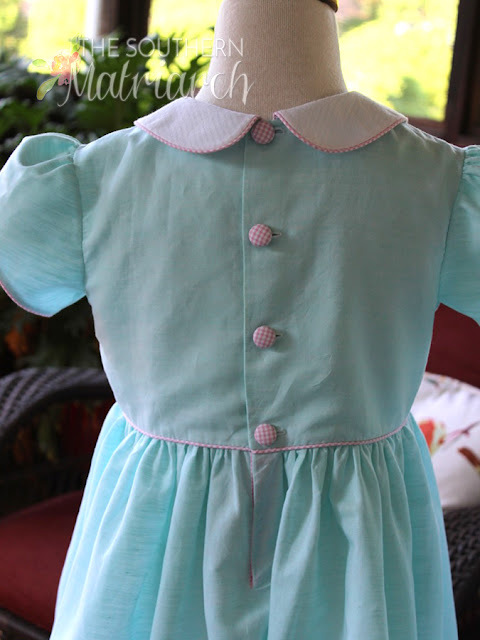 Unlike a pleated skirt or full smocked bodice, the insert is more rigid by nature and has a tendency to stand up away from the child like a placard. A more narrow insert has less chance of doing that. That is just my opinion. I chose to make the insert about one-third of the length of the bodice. The finished insert is approximately 3" of the 9" of the bodice front. This measurement might change depending on the size you are making. Try to keep in mind the rule of thirds and this will work well for you. I made this Children's Corner Lee for Princess last Easter. I smocked the plate as written and ended up with chocolate bunnies under her arms. I like picture smocking but not to have it end up under her armpits! She loved it and that is what matters. 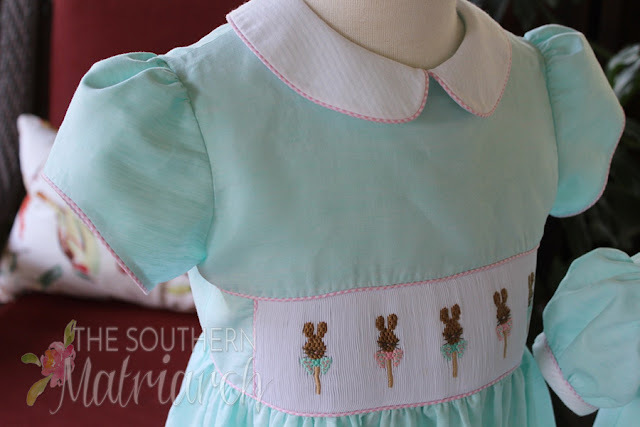 All that aside, I didn't want to smock bunnies for under her arms this year. So I chose to add "wings" to either side of the insert. A wing is a block of fabric the same depth as the pleated piece cut on the straight of grain. I joined these blocks on either side with a 1/4" seam. This join on either side left an opportunity to pipe! You know how I love piping. Make sure your wings on either side are of equal size. This piece will become your complete insert. 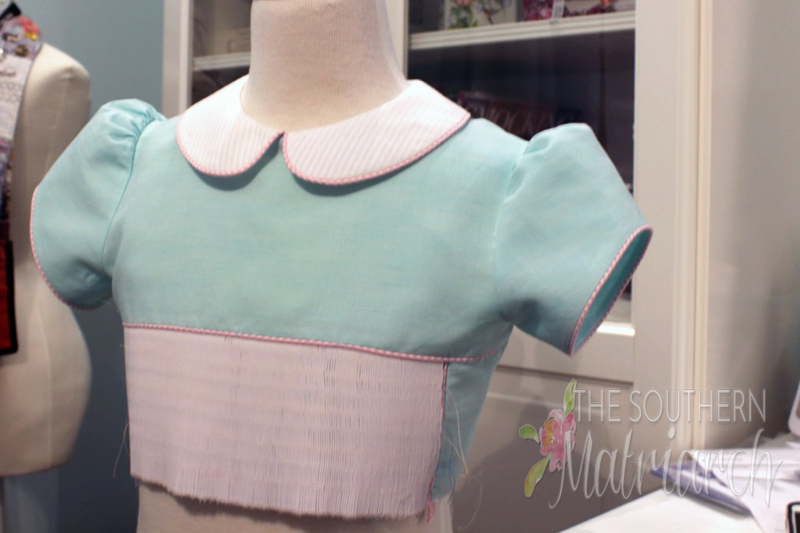 There are a couple of ways to alter your pattern for the bodice front. You can figure out the depth of your insert and cut away that same depth on your front bodice pattern piece. (Remember to add back on seam allowances at the bottom of the altered bodice front as well as the top of your insert.) Or if you are a short cut person like myself there is an easier way. Apply piping to the top of your insert. This is just basted for illustration, I would normally glue my piping on. And this insert is wider than the one on my dress, so there are no "wings" applied. Attach a block of fabric large enough to accommodate the upper bodice of your pattern piece. Again this is loosely basted for illustration purposes. You now have a block to be treated as one piece of fabric. If your pattern does not come with a full sized bodice pattern piece, trace one on a folded piece of tissue or tracing material. 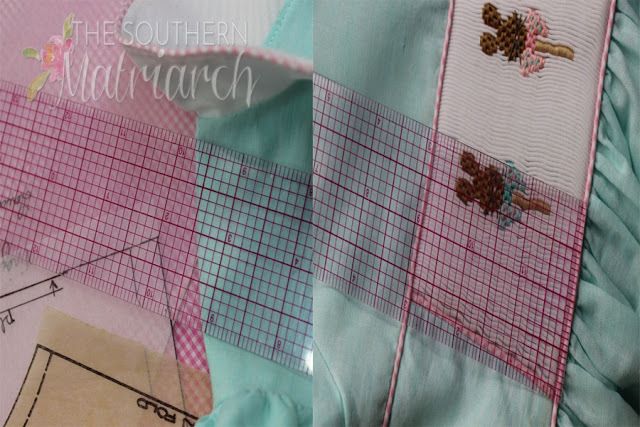 If you feel brave enough, fold your insert/fabric block in half making sure to center your smocked insert correctly on the fold. I am not that brave. 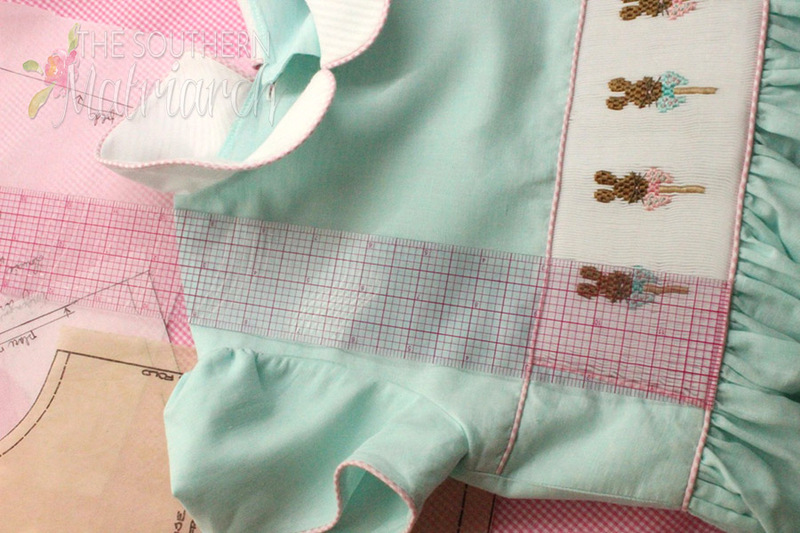 Place your full bodice pattern over your fabric block. Again making sure to center your smocking. Pin securely and trace around your pattern piece. 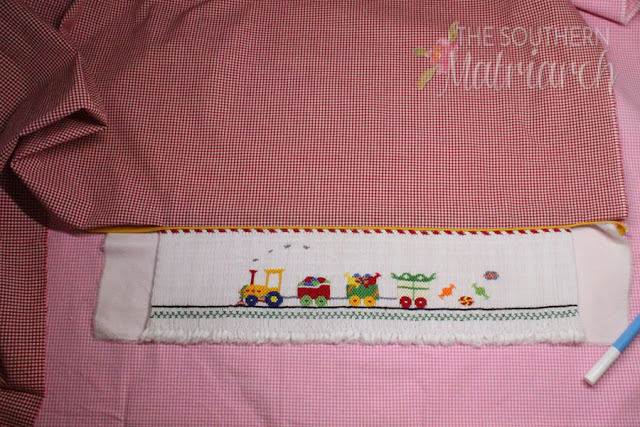 In this case where the insert goes the full width of the bodice, stitch a narrow, short zig-zag stitch around your pattern piece just inside where you will be cutting the pleats. 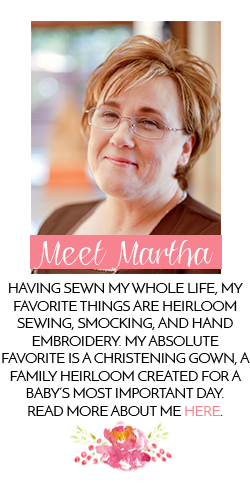 This will prevent your pleated piece from unraveling and losing its shape. Since my insert had the flat wings on either side this step was not necessary and I simply cut out my pattern. Another variance I made for this pattern was the order of work. In the pattern instructions it had you attach the skirt pieces to the front and the back separately. You ended up with a completed front of the dress and a completed back. Then it instructed to stitch the side seams together. I knew I wanted to pipe all the way around the skirt to the back placket so I completely constructed the bodice without the skirts first. Including inserting the sleeves. It is much easier to put in sleeves without the weight of the skirt involved. I then constructed the skirt, added the tucks and then attached it to the bodice with piping sandwiched between. No side seams involving piping and it is smooth all the way around the waist seam. 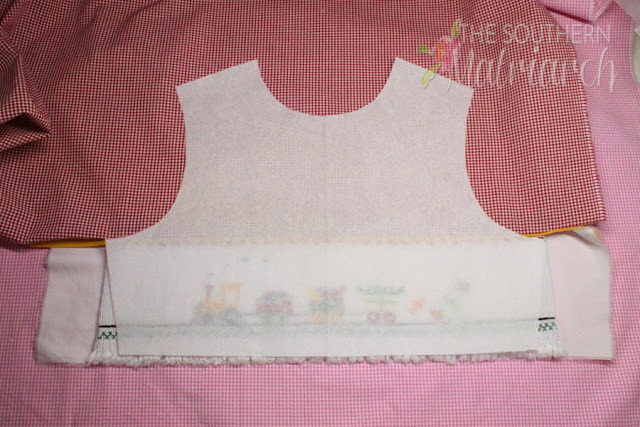 I hope this gives you the courage to try adding a smocked insert to a flat bodice. It really is quite easy. What is the name of the Chocolate Bunny plate? Way too cute. Thank you so much. This is so cute and has gave me the courage to give it a try. We do thank you for all the work you put into this and all of the other blog post to help us a long.